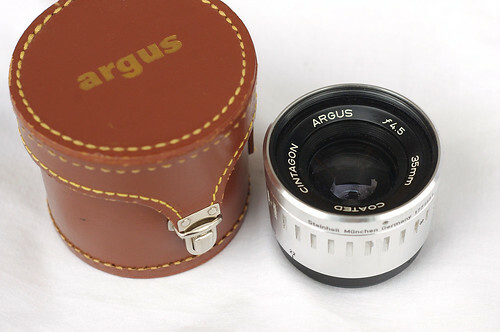 After the Geiss company produced a modification of the Argus C4 which permitted interchangeable lenses, Argus followed suit with the C44 (spelled out as "c-forty-four" on the camera itself). 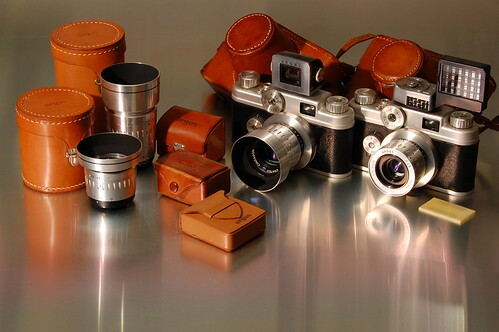 The camera shared the same body as the C4, including that model's improved rangefinder/viewfinder. The only real difference was in the lenses. The standard Cintagon 50mm f/2.8 was the first 4-element lens (Tessar-type) that the Ann Arbor factory produced. The design was said to have been computed with the help of an early digital computer, 'MIDAC,' belonging to the University of Michigan. Three other focal lengths were offered as well: 50mm f/1.9; 35mm f/4.5 and 100mm f/3.5. These were manufactured by Steinheil in Germany, to a somewhat higher standard of finish, but also branded Cintagon. However the C44 bayonet is clumsy to use, as a lens can not be mounted until pairs of small red guide marks inside the mount throat and lens bayonet are aligned. 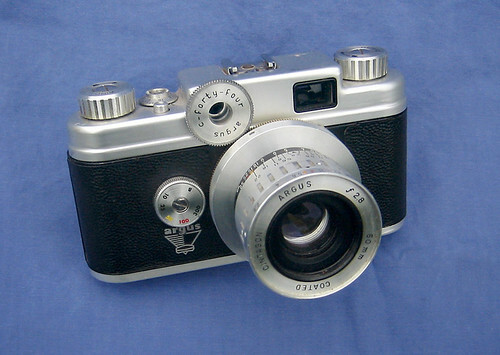 The C44 employs a behind-the-lens leaf shutter (as do other Argus C-series models), offering 1/10–1/300 second and B. This fires with an unexpectedly noisy snap, not unlike a mousetrap closing. The camera's frame counter counts down, so the user must remember to re-set it to the correct number of frames with each re-loading (and attempt not to bump it accidentally after that). A new C44 owner will search in vain for a rewind-release button. Instead, lifting and slightly twisting the advance knob disengages the film drive and allows the roll to be rewound. ↑ An Argus profile in the September, 1956 Popular Photography (Vol. 39, No. 3; page 16) notes ""It was also interesting to note that the availability of the MIDAC (Michigan Digital Automatic computer) 'magic brain' at the nearby University of Michigan premises was being used by the company's engineers to improve existing lens designs rather than to devise new formulas. The first product of their efforts, the 50mm Cintagon f:2.8 lens now being furnished as the normal lens on the new Argus C-44 camera, is said to be one of the first commercial lenses completely designed with the aid of high-speed automatic computing equipment.." (Thanks to Henry Gambino for locating this reference.) The U of M developed MIDAC in 1951 at their Willow Run Research Center, a room-filling computer using a rotating magnetic drum memory and fed with punched-tape inputs. A proposed "virtual" museum brochure has more details. This page was last edited on 28 November 2018, at 06:32.